The opening illustration depicts the act of creation and the beauty of the garden of Eden, when God first introduced plants, flowers, and every living thing into our natural world. The apple signifies the fall of man, separation from the Creator, and, ultimately, the need for redemption. Pictured here are the fire and burning bush—illustrated in the style of ancient Egyptian art—referencing when God visited Moses and displayed his power. The imagery points to the promises made to free the Israelites from their captivity, give Israel an inheritance, and establish the familial line of the coming Messiah. This illustration alludes to humanity’s relationship to the Divine God and the need for sinful people to offer sacrifices to God in order to absolve their guilt and gain his pardon. The illustrations depict the bird, grain, and burnt offerings described in detail in chapter 1. Aaron’s staff, pictured with almond buds and blossoms, signifies that he was chosen by the Lord to help guide his people toward Canaan. Despite their wandering, the promise of God remains, represented by the subtle cross illustration in the background. The bronze serpent indicates the Lord’s message to Moses in 21:8.
them into a rich land flowing with milk and honey—lush with both material and spiritual blessings. Joshua is appointed as leader of God’s people to complete the journey into Canaan. God continually promises to be with the Israelites and provide for them. The sun, moon, and clouds tell the story of chapter 10, where God prolonged the length of day so that Joshua and his armies could defeat the Amorites. Judges is the story of the rulers appointed over Israel—leaders the people desperately needed and yet by whom they were ultimately led astray. The grapes are a symbol of Israel’s disobedience leading to judgment, and the olive branch is a symbol of hope in a better and coming King. Bundles of barley here tell the story of Ruth and Boaz. When Ruth slept at his feet on the threshing floor, she invited Boaz to fulfill his role as her kinsman-redeemer, securing her future as well as the genealogy of Jesus. The barley is in the subtle shape of wings, symbolizing Boaz’s protection (3:9). The bows, arrows, javelin, sword, sling, and crown illustrated here showcase the transfer of power and the battles that took place during the reigns of both King Saul and King David. The palm branches point toward the eventual triumphal entry and reign of Jesus. Cedar trees (chapter 5), pinecones, and balsam branches symbolize the Davidic dynasty. In this book, David is crowned king and God makes a covenant with him, establishing Zion as a place of worship forever and laying the foundation for the familial line to continue for generations until the birth of Jesus. This book details the continued line of monarchies, particularly highlighting the glory of the wise and prosperous King Solomon (represented by the owl) and his preparations for the construction of the temple using cedar, cypress, palm trees, and floral decoration, among other ornate details and luxurious materials. Represented here is the chariot of fire and whirlwind of clouds by which the prophet Elijah was taken up into heaven, as recorded in chapter 2. Pictured here are the trees of the forest singing for joy as in David’s song of thanks after the ark of the covenant is placed in the tent in chapter 16. This book centers on the building of the temple and Solomon’s participation in its construction. Here, the peacock feathers mentioned in chapter 9 denote the wealth of Solomon and the luxury of the materials used to adorn the temple—the dwelling place of God. The theme of Ezra is God’s faithfulness to Israel and the rebuilding of the temple after the Jews return from captivity in Babylon. When the builders came together for reconstruction, they offered sacrifices of bulls, rams, wine, and wheat (chapter 6) and used cymbals and trumpets to call out to God in thanksgiving for his steadfast love and provision (chapter 3). This is the story of Nehemiah, the Persian king’s cupbearer, who played an important role as adviser. Because Nehemiah trusted in God, he advocated the rebuilding of the wall surrounding Jerusalem and proclaimed judgment and the need for repentance. The mosaic pattern here, inspired by ancient Persian art, is decorated with marble and precious stones to represent the royalty and special calling of Esther in a time where fierce persecution threatened to wipe out her people group. Because of her leadership, she was able to influence the king and thus save her people and preserve the bloodline of Jesus. The artwork here represents Job’s story of suffering and trial, as he lost all of the good things he had received from the hand of God. As he loses his family and suffers immense pain, Job recognizes that he will one day return to the dust. Despite his hardship, he clings to hope. The upright middle flower represents Job’s refusal to blame or curse God even while his body—symbolized by the outer flowers—wastes away. Detailed here is the scene from Psalm 42, where the image of a deer panting for water points to the innate human longing for the living water of our saving God. The teachings of Proverbs emphasize that wisdom begins with trusting and obeying the Lord. In 9:4 wisdom is likened to a graceful garland or beautiful crown placed upon the head. 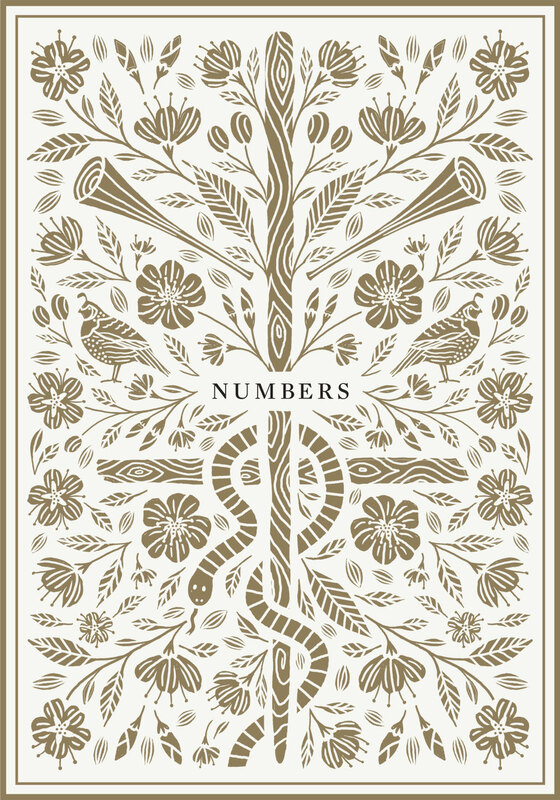 Divided into four equal parts, this illustration represents the seasons detailed famously in chapter 3, depicting distinct foliage from each part of the year. Pictured here are the lilies, rose of Sharon, precious dove, wine grapes, and pomegranates used in the poetry of Solomon to describe two lovers and their physical relationship throughout courtship, engagement, and marriage. In 58:11 those who trust in the Lord are compared to a flourishing and well-watered garden whose springs flow unceasingly. This is a picture of the complete restoration the Lord offers to his people and the earth one day. Amidst descriptions of destruction, the promise of the Lord to the prophet Jeremiah is hopeful, as God declares to Jeremiah that he has appointed him as prophet “to destroy and to overthrow” but also “to build and to plant” (1:10). The vision of the flowering almond tree detailed in chapter 1 symbolizes rebirth after a time of winter’s death and dormancy. Though much of Lamentations is marked by expressions of sorrow and regret, the final word is hope in God’s mercy to sinners. In 2:1 the text declares that the Lord “has set the daughter of Zion under a cloud,” while in chapter 3 the writer remarks that he dwells in darkness. Bitter tears lead ultimately to renewal and redemption for God’s people. In chapter 36, God promises to give believers hearts of flesh in exchange for hearts of stone. Here the imagery reflects God’s renewing work in sinner’s lives. Pictured here is the story of Daniel being thrown into the lions’ den—a display of God’s faithfulness and power to preserve his life. Throughout this book’s events, God makes it evident that he is in control and has ultimate authority over time, people, and events. Here, the grapes, leaves, and vines symbolize Israel’s unfaithfulness. The Lord had rescued them as one rescues “grapes in the wilderness” (9:10), but as the nation grew into a “luxuriant vine” (10:1), they nevertheless turned from him. And yet, no matter how wayward the Israelites became, God proved to be unrelentingly faithful. The dominant theme in this book is the “day of the Lord,” which includes both judgment and restoration. The locusts illustrated here are reflective of the plague the Lord sent on Israel as a sign of his anger and judgment for their sin and continued unfaithfulness. The pomegranates, mangoes, berries, and lychee (typical summer fruits) pictured here refer to the prophet’s vision in chapter 8 of a basket of seasonal fruit. After the people are threatened with punishment as a consequence of their rebellion, God continues to show mercy. The eagle, moon, and stars reflect the description of pending doom upon the nation of Edom. Though the people were flying high, God declared their destruction because of their unjust treatment of neighboring nations. The familiar story of Jonah is illustrated here with water and waves, as the prophet Jonah was swallowed up by a fish and ultimately delivered to Nineveh, where he was called by God to announce his coming wrath. The mountains, clouds, and valleys pictured here refer to the promise that “the mountain of the house of the Lord shall be established as the highest of the mountains, and it shall be lifted up above the hills; and peoples shall flow to it” (4:1). Thorny vines here represent the Ninevites’ entanglement with sin (1:9), about which the prophet has been sent to warn the people. Elements here represent the subject matter of the prophet Habakkuk’s conversation with God. In 1:8 the Lord answers Habakkuk’s prayer (or complaint) with a description of the enemy’s armies and the judgment coming upon Judah. Warnings of impending destruction fill this book, as the prophet Zephaniah declares God’s intent to punish the wicked nation of Judah for their sin and rebellion by sweeping them away—represented here by the wind and clouds in chapter 1. The logs and trees depicted here demonstrate the prophet’s charge to renew efforts to rebuild the house of the Lord after the exiles return to Jerusalem from Babylonian captivity. The myrtle tree pictured here (1:8) recalls the setting of Zechariah’s vision of an angel and four horsemen among the myrtle trees. In the vision, Zechariah learns about the reconstruction of the temple and the call of God for his people to take an active part in the growth and rebuilding. The wings pictured here point to God’s promises in 1:11 to make his name great from the rising of the sun to its setting. Those who fear the Lord look to the time when “the sun of righteousness shall rise with healing in its wings” (4:2). The mustard seed and flowering branch of its bushes illustrate Jesus’ parable (13:31–32 and 17:20) concerning the kingdom of heaven that grows from seeds sown in faith. The fishes in nets illustrated here reference the call of Simon and Andrew to follow after Jesus and become “fishers of men” (1:17), as well as the miracle of the feeding of the five thousand (6:30–44). The birds and lilies illustrated here refer to Jesus’ words in chapter 12, reminding his followers not to be anxious but to consider the ravens and the lilies, who do not labor or spin but are provided for lavishly by God himself. The hyssop plant flowers, spear, thorns, nails, and palm branches reveal the end of Jesus’ earthly ministry. During the triumphal entry, he rode into Jerusalem on a donkey while onlookers waved palm branches and cried out “Hosanna! Blessed is he who comes in the name of the Lord, even the King of Israel!” (12:13). When Jesus was nailed to the cross, a crown of thorns was placed on his head, and he was offered a drink on the end of a hyssop branch; as a fulfillment of prophecy, he was pierced with a spear in his side. Acts is characterized by God’s sending the gift of the Holy Spirit to the apostles, represented here by the dove, the flaming tongues, and a mighty rushing wind. In chapter 11 of Paul’s letter to the Romans, he explains the addition of Gentiles into the kingdom of God, comparing them to a shoot of branches grafted into an olive tree, thus sharing in the nourishing roots with the other branches (a symbol for the people of Israel). In Paul’s first letter to the Corinthian church, he offers encouragement, urging the Christians there to run the race of faith with endurance. The laurel crown here is a symbol of the imperishable wreath promised to those who run to the finish (9:25). In ancient Greece, laurel wreaths were awarded to athletes and Olympic victors. In chapter 4, Paul lays out his famous description of what it means for Christians to have hope in the unseen and to persevere through hardship, “carrying in the body the death of Jesus” (verse 10) by considering the gospel to be a “treasure in jars of clay” (verse 7). promised Abraham that his heirs would outnumber the stars in the sky, in order to remind the Galatian church that they are heirs according to this same promise. In chapter 6, Paul details the armor of God, which equips believers with everything needed to fight against the powers of evil in the world. The fireflies illustrated here reference Paul’s charge to the Philippians (in 2:15) to do all things without grumbling so that they might shine amidst the darkness around them by bringing the light of the gospel of Christ. 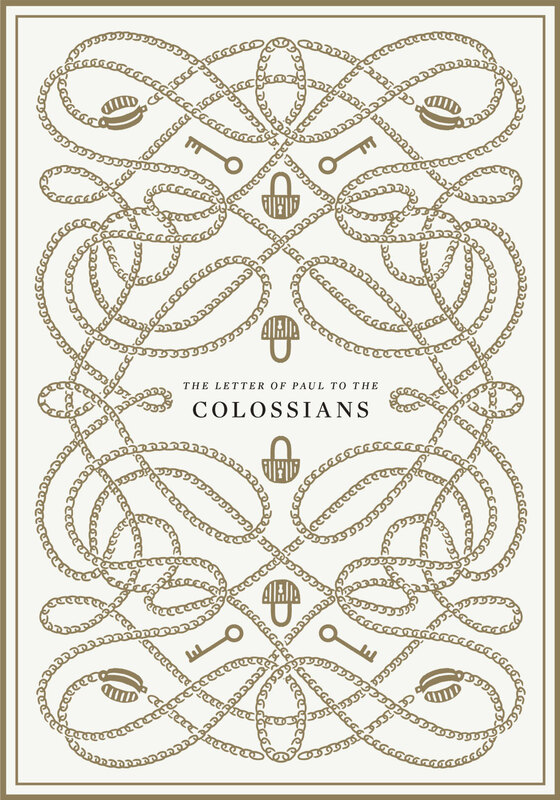 Since this letter to the Colossian church was written by Paul from jail, the theme of chains here speaks to the power of God to use Paul despite his hardship and weakness. The clouds and trumpet illustrated here represent the description of the coming of the Lord in chapter 4, where Paul describes the Lord descending from heaven with the sound of a trumpet. The second coming of Jesus is detailed again here, as Paul describes his return for judgment with “mighty angels in flaming fire” (1:7–8). Paul writes from prison to Timothy to encourage the church to stay strong through persecution, remain steadfast, and uphold a reputation for the church as a “pillar and buttress of the truth” (3:15). In Paul’s second letter to Timothy, he reiterates the charge to stay the course, encouraging Timothy to preach the Word and to “be ready in season and out of season” (4:2), especially considering the rise of unsound doctrine. This tree symbolizes seasons both of growth and life and of dormancy, preparation, and expectation. The theme of this epistle is the need for purity amidst an evil world. The streams and blooming foliage evoke Paul’s description of “the washing of regeneration and renewal of the Holy Spirit” (3:5). The message of this short book is the power of the gospel to change lives, turning uselessness into purpose (verse 11). Specifically, Paul references the slave Onesimus, who was converted under his ministry. Paul encourages his spiritual brother Philemon to receive Onesimus with Christian love and brotherhood, not bitterness. The superiority of Jesus and his status as High Priest plays a prominent role in Hebrews. In chapter 4, Paul urges believers to approach the throne of grace boldly to find mercy and grace in time of need. The flowers pictured here—freesia, Queen Anne’s lace, cowslip, and oleander—symbolize grace in Western culture. In 1:9–11 James describes the end of the rich brother. When the sun rises with its scorching heat, the grass withers and the flowers dry up and pass away. The same fate will meet the rich man who pursues vanity and riches. In chapter 5 of his letter to early Christians, Peter exhorts the leaders of the church to be careful to shepherd the flock of God without becoming conceited with power, instead leading gently and by example. This letter is filled with warnings and exhortations for believers seeking to withstand persecution and suffering, including the encouragement to pay attention to the prophetic word “as to a lamp shining in a dark place” (1:19). A recurrent theme in these three short books is light and the command to “abide” or remain in the light of the gospel, as illustrated here by shining beams. As John remarks, “The darkness is passing away and the true light is already shining” (1 John 2:8). The main idea of this short book is one of warning against false teachers. The language of verse 13 compares them to wild waves of the sea, tossing unstable minds around with their untruths. In 3:20 Jesus declares to the church, “Behold, I stand at the door and knock. If anyone hears my voice and opens the door, I will come in to him and eat with him, and he with me.” Illustrated here by an ornate door decorated with trumpets and a crown, the Bible’s closing book points to the return of Jesus on the last day, his coronation as King, the wedding feast uniting the bride and Christ, and the redemption of what was broken in the garden.